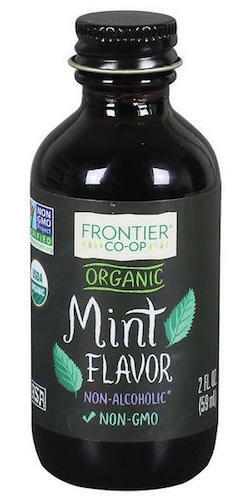 Frontier Natural Products Organic Mint Flavoring 2 oz. Organic Mint Flavor provides pure, fresh mint flavor for adding to beverages and dessert recipes. Add by the dash to icings, coffee, hot chocolate and milkshakes, or try it in chocolate candy, cake, pudding and cookie recipes. Ingredients: organic sunflower oil, spearmint oil peppermint oil.